Huế 1968: A Turning Point of the American War in Vietnam, by Mark Bowden; New York: Atlantic Monthly Press, 2017. I do not say lightly that, if it were not for the American soldiers and the soldiers of the South Vietnamese army, both of whom risked and sacrificed their lives during the Battle of Huế, I would not be alive today. In February of 1968 during the Lunar New Year, my mother, then only a teen, huddled in her home in the city of Huế with her mother and sister while her father was led away at gunpoint by Việt Cộng soldiers who looked no older than she was. For nearly 26 days and nights, my mother hid in her home trying to console her own mother whose fear gripped her so fiercely that she tripped and fell wherever she stepped. To this day, my mother still quivers at the memory of bloodied bodies in the streets of her hometown. 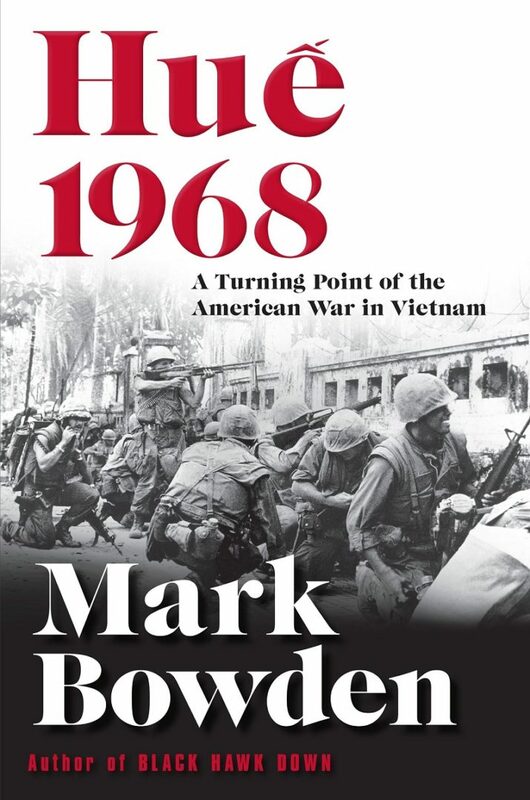 As a storyteller and a refugee whose life is only possible because of my mother’s safe passage through the 1968 Battle of Huế, I can appreciate Mark Bowden’s Huế 1968: A Turning Point of the American War in Vietnam, a gripping and dramatic narrative of the experience of American soldiers in the urban warfare that was the Battle of Huế. Read with previous works by historians Graham Cosmas (MACV: The Joint Command in the Years of Withdrawal, 1968-1973) and Dale Andrade (America’s Last Vietnam Battle: Halting Hanoi’s 1972 Easter Offensive), Bowden’s Huế 1968 is a compelling addition to the story of American soldiers in the Vietnam War. Huế 1968 is nonfiction storytelling at its best—reading like the perfect adventure story: a hero’s journey against the landscape of a ravaged flailing urban battlefield against a formidable and sympathetically presented foe; its heroes neither perfect nor utterly flawed but real and tragically human. Where their actions were more harmful than helpful to the Vietnamese people, Bowden does not scrimp on details that cast a less than favorable light on his heroes. Bowden also takes care to provide narratives from a diversity of perspectives—South Vietnamese families held hostage, American Marines who risked their lives, Việt Cộng soldiers and “revolutionaries” who coordinated the siege. That said, however, I am disappointed, daresay devastated (again…) at the absence of the voices of the Army of the Republic of Vietnam (ARVN), who serve as nothing more than background in a story for which they played a key role. The ARVN lost 458 lives in the month-long battle and the Americans lost 250 soldiers. Admittedly, Bowden does gives a brief spotlight to the ARVN’s defense of the city under notable ARVN such as General Ngô Quang Trưởng, commander of the ARVN First Division and Lieutenant Trần Ngọc “Harry” Huế, commander of the volunteer Hac Bao (Black Panther) unit, an elite reaction force. For the most part, however, Huế 1968 is mostly a back and forth between the Việt Cộng and the American perspectives. Equally frustrating, despite Bowden’s seemingly “neutral” portrayal of all sides of the Battle of Huế, was the absence of the perspective of the Nationalist. Though there are at least three or four sections that discuss in detail the “revolutionary” ideology of the Việt Cộng, I kept looking for, but did not find, a substantive discussion of the South Vietnamese struggle for democracy and freedom underlying their resistance. It was, after all, a failed attempt to instigate a popular uprising in the people to support the Communist agenda. Perhaps I’m being too hard on Mr. Bowden. The title of his book does clearly state that he’s aiming to present a narrative about the “American War in Vietnam,” perhaps intentionally ignoring the civil war at the center of the Vietnam conflict between the communist forces that infiltrated Huế and the South Vietnamese forces that fought to resist them. Forsaken Warriors: The Story of an American Advisor Who Fought with the South Vietnamese Rangers and Airborne by Robert L. Tonsetic – This memoir details the author’s experiences as Senior Advisor to South Vietnamese Ranger and Airborne battalions. And there may be more to look forward to. As our elders are entering the twilight of their years, we are seeing more memoirs published by Vietnamese people who lived through that era. It is a matter of time before these works are translated into English. For now, they are an untapped treasure trove of history for those of my generation whose grasp of the language fails us, but for whom hunger for our own history haunts us. Z.M. Quỳnh is currently working on a novel that highlights the experiences of ARVN soldiers. You can visit her at zmquynh.com.